​With a rental facility you can benefit from the latest equipment today. Plus, at any time you can update or add-on equipment without penalty. Changes can be made through a simple contract revision, often without any increase in the rental. ​Rental means that your capital is conserved. With a rental facility you can benefit from the latest equipment under the security of rental payments known also as constant cost. You can use your capital for the core areas of your business and attain higher returns. ​We can through our partner provide a lease rental option that helps spread the cost of your new solution over its useful working lifetime. 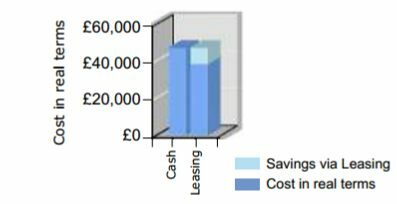 This allows you to relate day to day benefits with the day to day costs whilst potentially making notable savings over the term of the agreement (please see Graph and Table to the right) as the total rentals repayable are 100% tax allowable. NB: All figures are based on an assumed corporation tax rate of 25%, 1st yrs allowance of 25% and a 15% *Return on Capital Employed (ROCE). 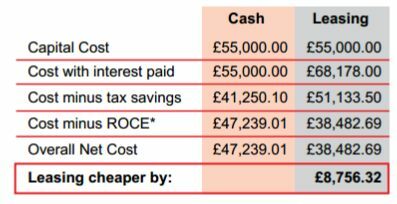 Disclaimer: This calculation is purely for illustration of the potential tax benefits when comparing a Finance Lease contract against an outright cash purchase. Assumptions are made with regards to the rate of corporation tax paid by a company or the rate of tax paid by a Sole trader or Partnership. For a more accurate assessment of your situation please contact an accountant or financial adviser. SIS and Clear Asset Finance do not accept liability for any incorrect assessment as this is purely a demonstration.